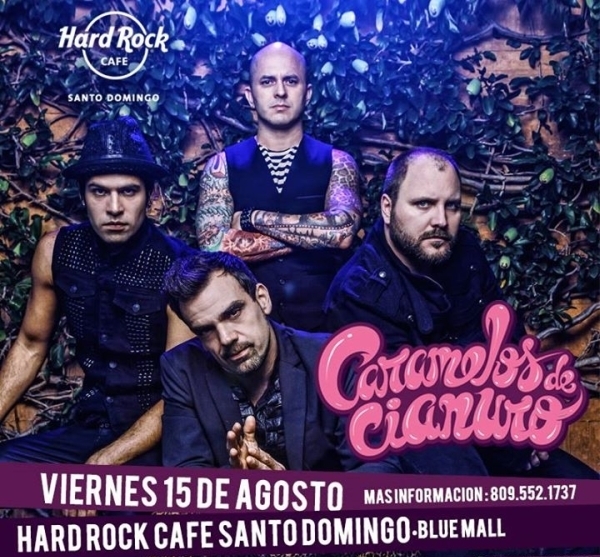 Caramelos de Cianuro, the renowned alternative rock band from Venezuela, is returning to Hard Rock Café to provide a memorable concert to their loyal fans playing their favorite rock music both old and new. Caramelos de Cianuro will be at the Hard Rock Cafe, Blue Mall, Santo Domingo at 10PM August 15, 2014. Ticket prices start at RD$1100 and can be purchased at Uepa Tickets, Movie Max, Supermercados Nacional, Jumbo and Hard Rock Café. Events concert, hard rock cafe, rock. permalink.